O great sage, let there be a perennial supply of water in this ditch that has become sacred. This will becomes famous on the earth by your name. Charitable gifts made here, rites performed here, penance pursued here, the sacrifices done here for the gods, and the Shraddha offered here to the manes, everything will be imperishable. So Gautama and other sages in the area come to the new body of water and start planting crops and the like again. But on one occasion, Gautama sends his shishyas (disciples) to get water, but they're stopped by the wives of the other sages, who want to get water first. The disciples complain to Gautama's wife Ahalya, who goes to the body of water and collects water before everyone else. The other sages are furious at this petty incident, so to get revenge they pray to Ganesha, who appears before them. The sages ask him to force Gautama to leave his hermitage; Ganesha first advises them not to try to harm someone who has only done them good, but they insist. So Ganesha approaches the sage Gautama, taking the form of a feeble cow, and starts eating Gautama's crops. To shoo the cow away, Gautama throws some blades of grass at it, but as soon as the grass touches the cow he sees it fall dead. 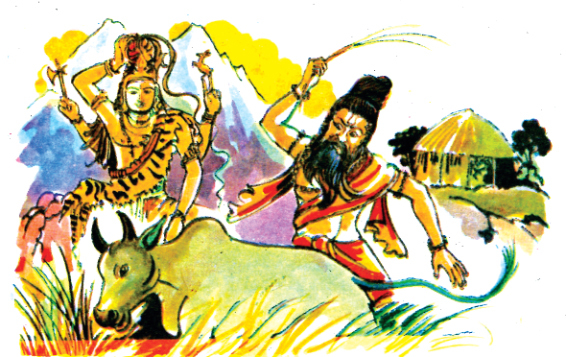 Gautama is shocked that he has committed Gohatya (cow-killing), a supreme sin in the Hindu religion, so he takes his wife and leaves the hermitage in order to undertake an arduous course of repentance that involves circumambulating the Brahmagiri mountain, going around confessing his sin to everyone he encounters, and making Lingams to worship Shiva. O goddess, till the advent of the Kali Yuga, when the son of Vivasvat shall be the twenty-eighth Manu, you shall stay here alone. I think this is a scrambled translation, by the way; there are only 14 Manus who rule in a given Kalpa, not 28. It probably means "till the advent of the 28th Kali Yuga, when the son of Vivasvat shall be the Manu", because the current Kali Yuga is the 28 Kali Yuga of the Vaivasvata Manvantara. And it probably means the end of the Kali Yuga, not the beginning, because the Godavari river is still here. So Ganga agrees to stay there as a new river, initially called the Gautami river but now known as the Godavari river. Gautama and his disciples bathe there to purify themselves of sin. And even the sages who tried to take revenge on Gautama are eager to get rid of the sins. Ganga is initially reluctant to purify these men who had been so cruel to Gautama, but then Gautama convinces her to relent and he digs a ditch for her to emerge from and purify the sages of their sins. That ditch is the famous Kushavartha Thirtha at the Tryambakeshwara temple. On a side note, like many parts of the Shiva Purana, at least some of this account seems to be a later interpolation, because it apparently references the Pachayata, a group of five gods who are worshipped in the Smartha sect founded by Adi Shankara, so it's an anachronism. Also, the reference to Ganesha may be a later interpolation, because references to Ganesha in the Mahapuranas are few and far between. You may also be interested to know that this apparently isn't the first universe that had a Godavari river in it; the next chapter of the Kotirudra Samhita of the Shiva Purana gives an account of how a similar story occurred in a previous Kalpa. The Rudra Gita from Varaha Purana refers to origin of river Godavari. Rudra gita is from Chapter 70 onwards of Varaha Purana. Rudra explains the origin of pashupata religion and in the process the origin of River Godavari occurs in Rudra gita in Varaha purana. Meaning: Rudra said - In Bharatavarsha, there is a forest called Dandaka. A brahmaNa named Gautama was performing severe penances there. On account of his penances, Brahma was pleased and asked him to seek a boon. 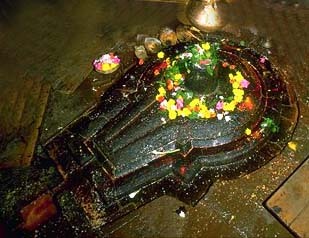 Meaning: Having asked this boon, Pitamaha (Brahma) granted it, and the rSi built a great Ashram in SatashRnga. Every morning, the rSi could reap the grain, cook it at noon and offer it to all his guests including the rSis and brahmaNas. Meaning: The rSi became accustomed to this routine. However, a great drought occurred which lasted for 12 years. Distressed by the lack of food and drought, the rSis living in the forest went to Gautama. Meaning: Seeing the approaching rSis , Gautama paid respects to them and asked those sons of munis to stay at his Ashram. Having told thus (by Gautama), the rSis stayed there eating a variety of foods until the drought was over. Once the drought ended, those brahmaNas desired to undertake a tIrtha-yAtra. Meaning: Then, the great muni mArIcha spoke regarding this matter to one going by the name of Shandilya, who was the best among munis doing penances. Meaning: Maricha said - O Shandilya! Gautama muni is like a virtuous father (to us). We should not leave this tapOvaNaM (place of penance) seeking other places without telling him.When spoken to in this manner, all the munis then laughed, saying, “Have we sold ourselves to him (Gautama) for partaking of his food? Meaning: Having spoken thus, they talked of leaving the place again and decided to go, creating a wondrous (illusory) cow, letting it loose in the Ashram. Meaning: When Gautama Muni saw that cow wandering around in his Ashram, he took some water in his hands and splashed it on his body. Then that illusory cow fell down even as a drop of water. Meaning: Seeing that cow slain thus, the munis proceeded to leave. Gautama, turning around, bowed to those munis and asked them, “For what purpose are you going so quickly, O rSis , leaving me, who is ever your devotee, who is always obedient to you. Meaning: The rSis said - “O mahA muni! So long as the sin of cow slaughter remains with you, we shall not eat your food”. Meaning: Hearing them speak thus, Gautama, who was conversant with dharma, asked the munis – “You who possess the wealth of penance give me (instructions) as to the prAyaschitta for killing the cow”. Meaning: “This cow is not dead but only unconscious. If it is bathed in the waters of the Ganga, it will rise up, there is no doubt. prAyaschittaM is for actual killing. For this sin, the mere performance of this vrata will suffice. Please do not be angry (about our leaving on this account)”. So saying, they left. Meaning: When they left, the intelligent Gautama went to the mighty Himalayas, where he undertook a great penance to worship me (Rudra). I was worshipped by him for 100 years and pleased with such penance, I asked him to seek a boon. Meaning: He asked me to give him Ganga of great ascetic merit held in my matted locksand to let go half of that sacred bhAgirathI river to follow him. Being asked thus, I granted him that auspicious river from one part of my matted locks. And he led the river to his place where the cow still remained. Meaning: Washed by that water, the cow rose up as a beautiful woman. The river became great and passed through sacred places. Seeing that phenomenon with wonder, the sinless saptarSis came there in their vimAna-s saying “very good”! Not the answer you're looking for? Browse other questions tagged mythology shiva scripture ganga .